I kind of fell in love with the idea of the Coquito – A Coconut Rum Cocktail, before I ever had my first sip of this cocktail concoction. Thinking back, I’m not even sure where I first heard about the creamy, frothy, coconut deliciousness laced with Rum and touched with cinnamon that is the Coquito. Def not when I was growing up in Iowa, lol! The Midwest weather, especially in Minnesota, where I live now isn’t traditionally considered to be too hospitable to people used to warmer climes – or even to us born here. The Coquito will make me forget all that, even though it’s January, now! But where ever I first heard of the Coquito, the idea percolated, then gelled and then just wouldn’t leave my head until I made a pitcher of them. Coquitos seemed a great excuse for a party and we had our dear friends and neighbors over to give us a hand with it! Well, we had to have something to go with our Pernil, a gorgeous, garlicky Puerto Rican pork shoulder, didn’t we? You know, to carry the theme forward. 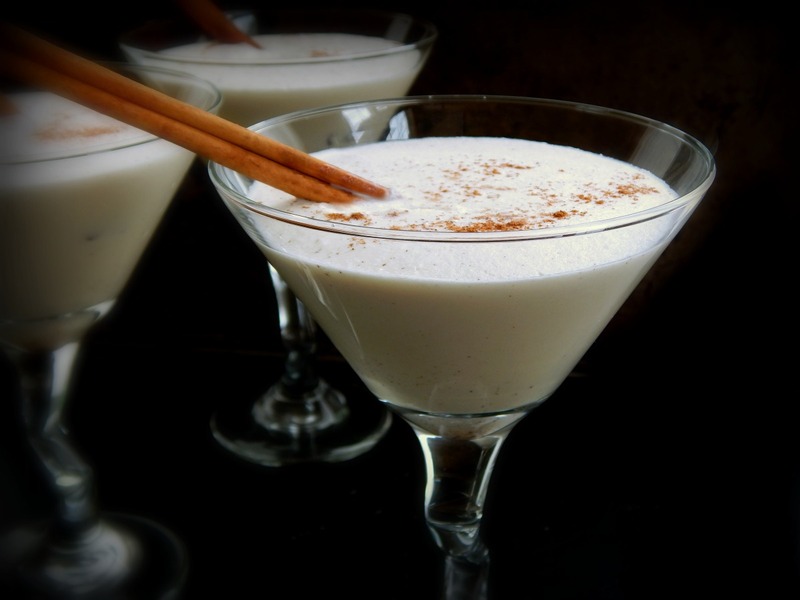 The Coquito originated in Puerto Rico, and is sometimes known as Puerto Rican Egg Nog (even though there is no actual milk, egg or cream) and is served throughout the Christmas season. It didn’t stop there, though. There are variations and close cousins of the Coquito throughout the Carribean. Wikipedia actually has a great write up with several recipes, but me? I like mine…what can I say? I seem to remember reading somewhere that in many warmer areas of the world, canned milk products became popular simply because of the lack of refrigeration. My Coquito – A Coconut Rum Cocktail has two kinds of canned milk products, the evaporated milk for substance and the condensed milk for sweetness. And then there’s the coconut milk, so maybe that’s three kinds of milk. Some versions of the Coquito use the very sweet Cream of Coconut – maybe next time I’ll go there but I was looking for something a little lighter today. I did read that “The Coquito, like revenge, is best served cold.” I don’t know much about revenge, but I do know these Coquitos didn’t really shine until they were chilled, then they were seriously delish. Make them ahead. I’m kind of glad we only had one pitcher because the Coquitos went down like a dream. They’re just one of those sneaky taste so good you might not think about the hooch kind of cocktails! Maybe that’s why they’re often served in small shot glasses in Puerto Rico? I guess I already told you the big secret of the Coquito. Make it ahead. Just put it in the fridge right in the blender container and you can pull it out and give it a whir right before serving. If you are doing multiple batches just fill up whatever pitchers or jars you have and then whiz each right before serving. If your coconut milk has settled into layers (that’s perfectly normal; just like non-homogenized milk the creamier part will float to the top) you might need to blend a little longer. And don’t forget the cinnamon and the cinnamon stick! The cinnamon just makes the cocktail. It’s such a nice contrast to have that cinnamony flavor sparking up all that creaminess. If you’re one to keep liquor on hand, sign up for the sales notifications on the emails from your favorite stores. There are big savings to be had when you buy your hooch on sale. The larger liquor stores (and of course, some of the smaller ones) generally follow a tradition of having a big, heavily discounted sale in either late February or early March, usually right after their annual wine sale. And you can’t go wrong restocking around just about any holiday. The milks like the evaporated milk and the condensed milk, are usually found on sale around the fall/winter holidays and again at Easter. Really look for them on sale around any holiday that has a lot of baking involved. I normally pick both up at Aldi, too, where the prices are often less than the sale prices at your regular store. If you haven’t shopped at Aldi, they’re a bit of a surprise. Coconut milk is rarely on sale in my area but I do often see it in the discount carts, bins or shelves at the store. Since the shelf life is usually way past the “best if used by” date, I don’t pay any attention to it at all, as long as the can is sound with no sign of damage. If it’s for sale, I pick up multiple cans for all kinds of recipes. Follow the tag at the bottom of the page. It’s also worthwhile to buy coconut milk in a Latin or Asian market if one is available. If that’s not an option, at least nose around the different shelves or aisles at your grocery. Your Coquito won’t know if it’s made with Mexican or Latin American Coconut Milk or Thai Coconut Milk, for instance. cinnamon sticks & a little extra ground cinnamon for garnish. Blend all ingredients except the cinnamon stick garnish in a blender at high-speed for three to four minutes, until mixture reaches a cohesive state. This may vary depending on the coconut milk. If the coconut milk has settled into layers, blend longer. Refrigerate (may refrigerate in the blender container) for at least two hours. Reblend shortly before serving. Serve straight or on the rocks with a sprinkle of cinnamon & cinnamon stick for a garnish. For a virgin drink, replace the alcohol with ice; it will help cut the sweetness. I’ll be taking my recipe for Coquito – A Coconut Rum Cocktail to the fiesta Fiesta Friday Link Party! This entry was posted in Click here for Fabulous Food Posts and tagged Alcohol, Beverages, cocktail, Coconut, coconut milk, condensed milk, evaporated milk, puerto rican, Rum. Bookmark the permalink. That sounds dangerously sweet creamy and delicious! Carlee, you’d love it!! I made it twice already! And I don’t drink a lot coz I’m a big woosey and think it has to taste good!! And boy, do these ever! lol! And right back at you!! Built in? How cool is that!! Well, now you have an excuse!! lol! Well it’s make ahead, so there’s plenty of time to get started! I love coconut rum and this drink looks great. I’m sure it tastes great too. 🙂 They’re a little dangerous!! I haven’t had coconut rum yet, but every time I go to the store I stand in amazement at all the new drinks, blends, cocktails, beers, alcohol, etc!! It’s wild and I need to drink MORE!!! lol!! ANd I highly recommend this!